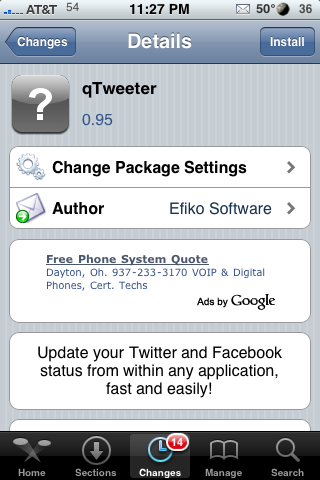 I did a review of qTweeter, an application that allows you to update your Twitter and/or Facebook status from any application, when it was first released in Cydia. 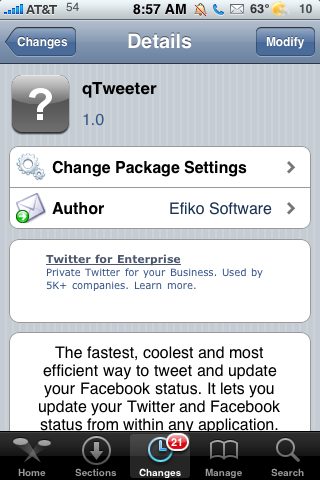 At the time, I found two downfalls with the app…there was no ability to tweet images using qTweeter and every time you launched it, it also launched SBSettings. Well, two updates later, I think we are good to go! Last night, just before going to bed, I checked Cydia like I always do. I was surprised to see that Ste Packaging had released an app (it has been a while since I have seen one from them). This instantly made me a little curious about the application so, I decided to check it out. At first I was like, “Yeah, that is just what I need…another Twitter application!” But, after I installed and tested the app…it realized this was like no other Twitter application I had!